The Nuwave Precision Induction Cooktop is Nuwave's latest home kitchen appliance. Also known as the Nuwave PIC, the cooktop will allow you to cook food at a precision temperature, giving you professional results. It is similar to DUXTOP induction cooktops. It claims it is energy efficient, easy to use/clean and safe. Unlike traditional cooktops, induction cooktops are more energy efficient as it doesn't take a long time to heat up your pots and pans. It is safe in that the cooktop never heats up, it only heats up the base of the cookware meaning anyone who accidentally touches the cooktop especially children will not be burnt. 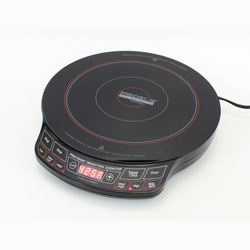 The Nuwave PIC 12 inch cooktop makes it very compact and portable which you can to take on vacations and barbecues. The best feature is its precision temperature control and timer which makes it very versatile turning it into a indoor grill, rice cooker, deep fryer, fondue cooker, steamer and even a slow cooker. With your help we can reach more people and let them know about Nuwave Precision Induction Cooktop whether this product works or not. Buy It on Amazon. Low cost shipping. I got it on Amazon. Paid around $13 for shipping. I phoned NuWave for clarifications BEFORE I ordered via their website 11-14-2013. Their sales reps also confirmed I can simply pay all at once, which I preferred. I think some super-villain like Lex Luther designed their online ordering process. It made me feel like I was being challenged by a wily opponent, or running a cyber-gauntlet, but I read each succeeding question/offer carefully and ended up doing OK. I went for their “BOGO” 2-cooktops-for-1 offer, and I opted to upgrade to the “PIC Pro” model. PIC PRO unit #1 base price was $129.94 ($24.99 more than the PIC2’s price of $99.99). S&H on that unit was another $29.95, for a total of $154.93. For PIC Pro unit #2, I paid a $24.99 ‘premium’ for getting the ‘pro’ version, and paid another $29.95 for S&H. Total cost of the 2nd unit was $54.94. So both Pro units cost a total of $209.87, or $104.94 apiece, including the S&H. I also went for the free “Complete NuWave PIC Cooking Package”. This introduced another $29.95 for S&H. The final charge against my credit card was $239.82. The charge showed up Nov. 17th NuWave sent me prompt e-mail confirmation of my order, but I had to email them on Nov. 18 to request a UPS tracking number. They promptly sent me the tracking number, and the shipment arrived intact on the morning of Nov. 20th. In a single 32-lb. box, I rec’d the two PIC Pro units (model #30301AR), and the cookware set (consisting of:a 9" frying pan; a 10½” frying pan; a 10 ½” dia. x 3” deep stainless steel pot; a 10½” dia. glass lid; a stainless steel steamer insert that can be used with the pot; a fondu-ring insert that can be used with the pot, and; eight fondu forks. I missed the fondu-thing in the 1970’s, looks like I now get a 2nd chance. The frying pans are stainless steel on the outside, with a copper-colored, “Duralon” nano-ceramic non-stick coating inside. Their bottoms are almost ½” thick. The stainless steel pot also has the thick bottom (but has no non-stick coating inside). The glass lid fits either the 10½” pan or the 3”-deep pot and has a little steam-vent hole in it. I placed the 10½” pan onto the cooktop, sprinkled perhaps ¼ oz. of water into it. Since I know water will always boil at 212F (at sea level), I used that fact to gauge how accurate the cooktop settings were. I turned on the cooktop, and initially set it to its lowest setting, just 100F. The empty pan got barely warm to the touch almost instantly and stayed that way. So that setting seemed about right. I then set it for 150F, and gave it a couple minutes to stabilize. Once I heard its electronic controls rapidly cycling off-and-on, I knew it was stabilized. I slowly raised the temperature setting in 10F steps until it was set at 200F, and sprinkled more water as needed. Then I raised it in 5F increments, pausing each time to wait for the faint sound of the electronics ‘cycling’ to hold the new setting. At the 210F setting, the water droplets didn’t boil, at 215F setting they did. At 210F again, they didn’t. This told me that the temperature settings are accurate when the cooktop is used with their own empty 10 ½” pan, and that the cooktop can hold a temperature that varies no more than 5 degrees F. There is no way to predict whether YOU would get the same results with a different pot or pan, because it may have different induction/magnetic properties, or thickness or something. Some pots & pans heat up differently than others, even if they are all rated “induction ready”. Your best bet is to perform the same little test with your own cookware and see how it behaves. All I can say is this: …both PIC Pro units they sent me were highly accurate and behaved identically when used with their own 10½” pan (model #32004), when that pan was EMPTY except for a few drops of water. The cooktop settings became less accurate when I poured 10 cups of water into the 10½” pan…. I placed the 10½” frying pan onto the cooktop, added 10 cups of room temperature (72F) water, and turned ON the unit to its highest “Max Sear” setting. It took 7 minutes to bring the water to a full, rolling boil. My home’s line voltage was 122.5V. NuWave’s “less than one minute to boil” claim needs to be clarified. I then set the LED display to 215F: the boiling quickly stopped and the water temperature dropped to 190F before stabilizing. This was 12% lower than the 215F setting I had entered, as measured using my ASCI-certified Kessler lab thermometer at proper immersion. To maintain a gentle boil (212F), I had to input a setting of 275F. Thus, the actual temperature produced (212F) was 23% lower than the unit’s LED readout of 275F was indicating. I noticed that the boiling bubbles would initially concentrate in a circular band that was about 6 or 6½” in dia., roughly corresponding to the red circle on the cooktop’s surface. Obviously, this traced the location of the induction coils that were heating the pan. As the gentle boiling continued, the bubble formation became more uniformly distributed, showing that the 10½” pan was doing a good job of distributing the heat input. I performed the exact same test with each unit and they again performed EXACTLY way. They were both “off” by the EXACT same amount. I was impressed by how consistent they were with each other. Something like that doesn’t happen by accident. As I mentioned, my 215F settings on each unit produced an actual water temperature of 190F. I allowed the electronics to stabilize into that rapidly cycling off-and-on state and remain that way for 10 minutes while I monitoring the lab thermometer readings. When the LED was set at 215F, both units maintained the water within a narrow temperature range of 188-191F degrees. The PIC Pro cooktops I received really are able to maintain a precise temperature. The only problem is that, once I added 10 cups of water, the LED readout no longer matched the actual water temperatures being produced. In all fairness, let me point out that a 10½” dia. pan is shallow and has a large surface area to “lose” (dissipate) heat, as compared to a narrower, deeper pot. And water heats up differently than cooking oil. If I’d heated up 10 cups of oil instead of water, or maybe only 4 cups, perhaps the LED readings would’ve been closer to being reality. I have to give NuWave credit for the fact that BOTH my units performed identically, and BOTH of them were able to maintain a temperature that varied by less than 3 degrees (F). That sort of repeatability is not easy to achieve. These things are definitely not toys. I’ve seen NuWave induction cooktop reviews on Amazon.com (mainly the 4-star ones) that thoughtfully try to explain some of the physics and performance characteristics, to fill the info-void NuWave appears content to leave us with. That’s cool. Here’s my own contribution to the ‘cause’. OK. Regardless of manufacturer, I believe there is almost always going to be a temperature difference between the setting you enter into these induction-type units and what you actually get. Variations in your own cookware’s dimensions and induction properties, and the manner in which it is being used (as griddle? as oven? as oil fryer? as water steamer? ), can produce widely varying results. Dumping some water or oil into the cookware introduces yet another variable which will have an effect on the temperature you end up obtaining. The only way any of these induction-type cooktops could be truly accurate is if they came equipped with a means for the cooktop to measure the temperature of the water, oil oven, griddle, etc. that is being heated, -such as a wired external probe you could stick right into whatever is being heated. Otherwise, the best they can do is measure the temperature of the bottom of the object being heated (bottom of the pan, pot, oven, griddle, etc. you are using) where it contacts the surface of the cooktop unit. Other than that, these induction-cooktops are running ‘blind’. Apparently, NuWave calibrates their PIC Pro cooktop unit for use in combination with their own cookware (such as that empty 10½” pan I’d received from them). My results matched theirs, when their pan WAS EMPTY. But once I added the 10 cups of water, everything changed. The cooktop settings were now inaccurate. Since we are not provided with an external temperature probe, we are left having to come up with our own means to independently check the true temperatures being produced. So, I suggest you may want to go out and buy an inexpensive (but reasonably accurate) candy thermometer for maybe $5. If you’re using the induction cooktop to heat a dutch oven, also buy one of those cheapo (but accurate) in-the-oven thermometers for maybe another $5. Using these inexpensive items, you can determine, thru trial-and-error, what setting you need to enter into your NuWave PIC unit (or any other similar induction cooktop) to produce your target temperature. For example, let’s say you’ve entered 350F into the cooktop unit and you’ve allowed your pot of cooking oil to reach a stabilized temperature, but your candy thermometer says your pot of oil is only at 280F. Now you know you need to enter a higher cooktop setting, -maybe try 440F. OR…let’s say you’ve entered that 350F setting and your oil is getting way too hot. You know you have to enter a lower setting. Once you’re successful, write down the ‘good’ setting you’ve figured out, and note which pot or pan you used, and how much oil (or whatever) you were heating in it. (Remember: some pots/pans are “hot” induction-wise, some are “cooler”.) The next time you do it, you’ll know exactly what to do and what to expect. Gradually, you will develop a ‘feel’ for how your own induction cooktop behaves with your own cookware. I’m not making excuses for NuWave or any other manufacturer. I’m just a person who has purchased an induction cooktop and is now trying to figure out the best way to use it to get consistent results. I’m sure there were plenty of complaints about microwave ovens in the 1960’s and 70’s when they were the ‘latest thing’. On a positive note, --the cookware they sent me is the bomb! No complaints at all about the quality of NuWave’s cookware. Time will tell whether that Duralon non-stick coating holds up on the frying pans, but there’s no doubt that the cookware I rec’d is top notch. Plus, I got some really high-quality ‘free’ cookware for only $30. The 9” pan alone is worth more than that. And, I like the technology, with its relatively low consumption of electricity. Hurricane Sandy left me without power for 8 days, and I was using a 6500W generator to struggle along. My home’s electric stove would’ve been too much for my little generator to handle, so I had to cook on my outdoor BBQ grill. If I’d had an energy-efficient induction cooker, I would’ve still been able to do some indoor cooking. I just rec’d these things from Nu-Wave recently. I have no experience with actually cooking with them yet, but am very intrigued with their ability to maintain temperatures within a precise temperature range, -especially at the lower settings. I have every reason to expect that of I had wanted to, I could have set either one of my PIC Pro units to some setting, say 115F, and it would have maintained my (empty) 10½” pan at 114-116F, once I’d allowed a few minutes for the electronics to stabilize. I am not aware of any other way to do that in the kitchen. I’m looking forward to checking it out. I did not like NuWave’s tricky online ordering sequence at all!! It first required that I submit my credit card info etc, and then it hit me with a series of maybe 15 successive questions about whether I want to buy this or buy that. I can easily see how lots of other people could become annoyed with it, and take their business elsewhere. If the online ordering process had unnerved me, I would've stopped, and clicked OFF the entire site. I would've known I hadn't yet given my final approval to bill my credit card until I’d OK'd everything in the final "review order" window, at the very end of the process. If I’d backed out, I would’ve closely monitored my credit card to make sure no unauthorized charges appeared. But everything went smoothly online, my credit card was billed Nov. 16/17th in the correct amount, and I received the correct items via UPS quite quickly. As I mentioned before, I feel NuWave/Hearthware is negligent in their failure to present their customers with the sort of performance information that I (and some other reviewers) are trying to provide you with. I feel that NuWave should be upfront and explain that ALL induction cooktop units (not just the ones they are handling) will produce temperatures that can significantly vary from the settings we input. It all depends on: the induction-characteristics of the cookware being used; the cookware’s size & shape; the type of material being heated in the cookware; the volume/amount being heated; etc. These are all things that are out of NuWave’s control: why not acknowledge that these sort of temperature differences come with the territory (for NuWave and for all its competitors) and maybe give us some general tips or guidelines for dealing with these inevitable differences? THEY SHOULD ALSO LOOK INTO PROVIDING AN EXTERNAL TEMPERATURE PROBE FOR USE WITH THEIR INDUCTION COOKTOPS !!! Back in the 1960’s, when the first microwave ovens were being marketed, consumers had to get used to the idea that placing tin foil and metal cookware/utensils placed in a microwave would produce frightening results. But the people got used to this limitation and quickly learned to accept them, because the microwave benefits far outweighed the negatives. To me, NuWave is at a similar junction right now. They should be teaching their customers how to better use this new ‘induction’ technology they are marketing –not stonewalling everybody. NuWave’s marketing mindset seems to be 25 years behind the times, acting as if the one-way medium of TV still holds sway. Make a glitzy ‘infomercial’ loaded with hype to lure buyers, and then throw them to the wolves. Really? We’re well into the 21st Century, guys. The “audience” talks back now. They communicate and exchange opinions instantly on the internet, FaceBook, Twitter, etc. PEOPLE ARE READING THIS REVIEW, RIGHT NOW !! NuWave has a decent product, -why not just sell it at a decent price (for a decent profit) and dispense with all the clever sales gimmicks? Their excessive hype is creating unrealistic expectations in peoples’ minds. It’s sowing the seeds for customer dissatisfaction. They’ve even managed to earn the worst possible rating from the Better Business Bureau (an 'F'). They’re an unattractive company selling some beautiful products. Beauty and the Beast. The negative blogs and reviews and comments are going to catch up with them. If they want to stem that tide, they need to start embracing ‘openness’. It seems to me this sort of “openness” approach would be a major step in the right direction toward improving consumer confidence and trust. Hey, maybe NuWave has a ‘take-the-money-and-run’ business model and doesn’t care about tomorrow. But if they want to secure a stable and lasting market niche, they’re going to need to change their entire marketing/sales style, and dramatically improve customer relations. Nevertheless, they did sell me some fine quality products at a decent price, and delivered them as promised right on time, so I’m still giving them 4 stars. My own personal experience with them has been fine thus far. I can’t say whether you would fare as well. But I would recommend purchasing their PIC Pro induction cooktop (model #30301AR), and I am quite pleased with the “Complete NuWave PIC Cooking Package” that I also received from them. I phoned NuWave for clarifications BEFORE I ordered via their website 11-14-2013. Sales rep also confirmed I can simply pay all at once. The online process was overly treacherous, but I read each succeeding question/offer carefully. I went for the “BOGO” 2-for-1 offer, and I upgraded to the “PIC Pro” model. PIC PRO unit #1 base price was $129.94 ($24.99 more than the PIC2’s price of $99.99). S&H on that unit was another $29.95, for a total of $154.93. For PIC Pro unit #2, I paid the $24.99 ‘premium’ for getting the ‘pro’ version, and paid another $29.95 for S&H. Total cost of the 2nd unit was $54.94. So both Pro units cost a total of $209.87, or $104.94 apiece, including the S&H. I also went for the free “Complete NuWave PIC Cooking Package”. This introduced another $29.95 for S&H. The final total cost I paid was $239.82 on my credit card. NuWave sent me prompt e-mail confirmation of my order, but I had to email them on Nov. 18 to request a UPS tracking number. They sent me the tracking number, and the shipment arrived intact on the morning of Nov. 20th. In one big, heavy box I rec’d the two PIC Pro units, and the cookware set (consisting of:a 9" frying pan; a 10.5" frying pan; a 10.5” dia. x 3” deep stainless steel pot; a 10.5” dia. glass lid; a stainless steel steamer insert that can be used with the pot; a fondu-ring insert that can be used with the pot, and; eight fondue forks. The frying pans are stainless on the outside, with a copper-colored, “Duralon” nano-ceramic non-stick coating inside. Their bottoms are almost ½” thick. The stainless steel pot also has the thick bottom (but has no non-stick coating inside). The glass lid fits either the 10.5” pan or the 3”-deep pot and has a little steam-vent hole in it. Each PIC PRO unit is about 12” dia. x 2.5” high, except it’s 14” across in the front area where the push-button controls are. The actual induction heating area (within the red circle) is 6.5 inches in diameter. The outer white ring (cosmetic only) is 9” in diameter. All controls except ‘program’ (staged cooking) are EZ to figure out without the manual. A big, red LED displays your settings. Panel has six temperature presets: Low (100F); Med. Low (175); Med. (275); Med. High (375); High (425), and; Max. Sear (560F or above). You select a preset, then adjust the temperature up-or-down in 5F degree increments to your desired setting. I did some quick tests on both the units I rec’d, and I must agree with everyone that the displayed temperature readings are inaccurate, even when using NuWave’s own induction cookware. Here’s how I performed my little tests… I put the 10.5” frying pan (at room temperature, 72F) onto the first PIC Pro unit (#1), added 10 cups of 72F water, and turned ON the unit to its highest “Max Sear” setting. It took 7 minutes to bring the water to a full, rolling boil. My home’s line voltage was 122.5V. I then set the LED display to 215F: the boiling quickly stopped and the water temperature dropped to 190F before stabilizing, as measured using an ASCI-certified Kessler lab thermometer at proper immersion. To maintain full boil, I had to set the temperature to 275F. Water boils at 212F (at sea level). When set for 215F and given time to stabilize, that particular PIC Pro unit (#1) produced actual water temperatures that were 12% lower than the LED setting indicated. When set for 275F, it got the water gently boiling at 212F, which is 23% lower than the unit’s LED readout was showing. I performed the exact same test on the 2nd PIC Pro unit I rec’d, and it performed EXACTLY the same as the first unit I tested. They were both “off” by the EXACT same amount. I was surprised by how consistent they were with each other. And, I noticed that once each unit stabilized itself at a certain temperature (such as when my 215F LED reading produced an actual water temperature of 190F), I could hear its electronics rapidly cycling off-and-on to maintain whatever target temperature it thought it had achieved. I allowed each unit to do this for 10 minutes, while continuously checking the lab thermometer readings. When the LED was set at 215F, both units maintained the water within a narrow temperature range of 188-191F degrees. These things really are able to maintain a precise temperature. The only problem is that the LED readout did not match the actual water temperatures I was seeing. In all fairness, let me point out this was an amateurish testing setup. Water heats up differently than cooking oil. If I’d heated up 10 cups of oil instead of water, or maybe only 5 cups, perhaps the LED readings would’ve been closer to being accurate. Some of you readers may want to do your own little tests and report them. My results also could have been skewed by the fact I had the water in the 9” dia. shallow pan, which has a large surface area to “lose” (dissipate) heat, as compared to a narrower, deeper pot. And, I don’t even own the optional grill, griddle or oven: perhaps the readings would be more accurate when used that way, instead of when heating oil, or water. I have a science background, and know that highly accurate, laboratory-grade “oil bath” heating equipment can cost way over a thousand dollars, so I don’t think it’s realistic for consumers to expect a $100 kitchen-based unit to achieve that level of accuracy. But I do think NuWave should make an effort to get its readout temperatures to better reflect reality. Or, perhaps NuWave should provide more-detailed information about the various ways the LED temperature setting can vary from the actual temperature produced, and how we users can compensate for the difference(s). I have to give NuWave credit for the fact that BOTH my units performed identically, and BOTH of them are able to maintain a stable temperature that varies by only a few degrees (F). That’s not easy to do. These things aren’t toys. But if NuWave is unwilling to acknowledge and/or explain these temperature differences we all are seeing, they deserve all the negative comments their PIC products are generating. OK. Regardless of manufacturer, I believe there is always going to be a temperature difference between the setting you enter into these induction-type units and what you actually get. Variations in your own cookware’s dimensions and induction properties, and the purpose to which it is being used (as griddle? as oven? as oil fryer? as water steamer? ), can produce widely varying results. The only way any of these induction-type heaters could be truly accurate is if they came with an external probe you could stick right into the water, oil, or oven. Otherwise, the best they can do is measure the temperature of the bottom of the object being heated (bottom of the pan, pot, oven, griddle, etc. you are using) where it contacts the ‘glass’ heating surface of the unit. Since you don’t have the external probe (‘thermometer’), you have to come up with your own thermometer as a means to independently check the true temperatures being produced. So go out and buy a cheapo (but accurate) candy thermometer for maybe $5, and buy one of those cheapo (but accurate) in-the-oven thermometers for maybe another $5. Using these inexpensive items, you can easily determine what setting you need to enter into your NuWave PIC unit (or any other similar induction heater) to produce your target temperature. For example, if you enter 350F into the PIC unit, but your oil only gets to 280F, you know you need to enter a higher PIC setting, -maybe try 440F. If you enter 350F into your unit and your oil is getting way too hot, you know you have to enter a lower setting. Once you’re successful, write down the ‘good’ setting you’ve figured out, and note which pot or pan you used. Some pots/pans are “hot” induction-wise, some are “cooler”. I’m only being realistic. I’m not making excuses for NuWave or any other manufacturer. I’m just another guy who bought these things and is now trying to make sense of them and figure out the best way to use them. I’m sure there were plenty of complaints about microwave ovens in the 1960’s and 70’s when they were the ‘latest thing’. On the NuWave website, they play this video showing how you can even place sheets of paper between the PIC unit and the cooking pan. I haven’t tried it, but I’m quite certain that would cause the pan to heat a little more slowly because the pan is now a little farther separated from the ‘glass’ induction surface. Seems to me this would produce yet another difference between the LED setting and the actual temperature you get. On a positive note, --the cookware they sent me is the bomb! No complaints at all about the quality of their cookware. Time will tell whether that Duralon non-stick coating holds up on the frying pans, but there’s no doubt that the cookware I rec’d is top notch. I just rec’d these things from Nu-Wave yesterday: for all I know they’ll short-circuit tomorrow, right? But right now, this newbie is willing to give NuWave the benefit of the doubt. If that changes, I promise you that I will have a nice, juicy, unfavorable follow-up to my current review. I’m not going to complain about their customer service etc. yet, because I personally haven’t experienced any of that (yet). So, Mr. NuWave. Quit hiding in your office and explain to us the conditions under which your PIC’s are calibrated. Be honest and tell us what we need to do to get the LED settings to better match the temperatures we are actually getting. I’m just some goofball with a thermometer in my kitchen, --you’re the pro. How’s about giving us a little peak into your crystal ball? And “chill” with the hype! Whether you realize it or not, your excessive hype is creating expectations in peoples’ minds that you are unable to meet. If you became “more real”, you would get far less negative reviews (and returns) from your customers. I guarantee it is hurting your bottom line more than you may think. So far, I rate it at 4 stars out of 5. I’ll be back with a follow-up review, later. My Mother purchased this product for me as a Christmas present. She received the BOGO as ordered w/cooktop, steamer/fondue set, & 2 green pans. She is keeping the other set for herself. I can honestly say I absolutely love the product. It cooks evenly, efficiently and holds temperatures perfectly without hot handles or burnng. It's extremely user friendly and cleanup of cooktop and pans is a snap. I find meal making easy, quick and fun. Now the only thing I can see that could improve this buying experience is that when you have this great a product why not charge a fair price for the product itself, even if that happens to be a bit more and charge shipping and handling at a fair rate also. In addition make sure your matter of filling orders is consistently fair and reliable. I would now be very interested in ordering grill, carrier, and griddle but am hesitant with the bad order fullfilling feedback. My Mother was interested in additional sets of these but became wary after hearing these reports. I implore this company to address this matter of better business policy ... There are ways and you can do better with this fantastic product. I feel that my 85 year old Mother will be safer using this product. I paid twice for shipping and handling and they keep on saying that it was not incuded. I calle prior to placing the order and got a total and then i had to call and pay more. Still did not get what i paid for and they do not return phone calls . It will get very ugly with them. Buyer beware!!!!! this is a scam. I can't tell you if the product works or not. I ordered the two Induction Cooktops and thought I was also order the Cooking Packages that came with each Induction Cooktop. I only purchased the two cooktops and two carrying cases and that came out to almost $206. I never got the two Cooking Packages; apparently those will cost and extra $140. And don't try calling them to inquire about ANYTHING. I have left 5 voice messages in 8 days and have yet to receive a single return call from them. I guess reporting them to the BBB will be the next step. It's an excellent Product. I love it. Much better and safer than the stove top. I really can't tell you if the product is good or bad. I saw the infomercial and ordered the unit expecting the free 2nd unit and FREE cookware if I paid the additional shipping and processing. It's funny, they ship the first unit for $29.95 and charge $39.95 for the second, even though they both came in the same box. The scam is that you think you're getting the FREE cookware but they then inform you that will cost you an additional $139.90 shipping. This makes the total for the two units $308.80. I sent my units back and lost $69.90 on the transaction. So, BUYER BEWARE!!!! I've never received my second 'free' cooktop and it is on backorder, They are still selling the device to others, so they are not out of product. Others are complaining as well - search for them - and many are saying NuWave is requiring them to provide additional fees.